Sisak-Moslavina County is a regional authority, in charge for development policies, environment protection, coordination of local powers at regional level. 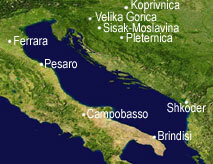 The county will be at the same time Watercycle partner and Croatian Lead Partner, playing as a coordinator for project activities in Croatian territory and at the same time undertaking direct actions on it's own territory. Beneficiaries of the actions will be citizens of the County, municipalities, technical bodies, farmers, entrepreneurs, local NGO's operating in environment protection. A4 Utilisation and promotion of utilisation of thermal waters for health, tourism and energy purposes – Feasibility study.